Charleston Garage Doors | About Southeastern Garage Doors, Inc.
Charleston's garage door professionals since 1999. 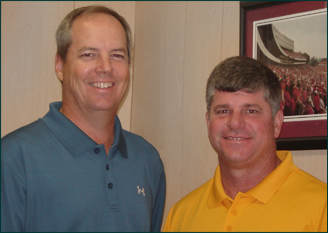 Southeastern Garage Doors was started by Leon Leggett and Steve Borders in 1999. Recognizing a need for higher quality service and more extensive product offerings in the residential garage door market, Steve and Leon applied to the business lessons learned in careers in professional sales and management with Fortune 100 companies. The company has steadily grown over the years and now includes sales and service for a wide variety of garage doors and openers and serves many builders in the Charleston Trident area. Whether a large development or high-end custom home, we’re experienced and skilled in working with architects and builders to find the right solution for your needs. Although the company has grown significantly, exceptional service continues to drive everything we do, and our staff members are with us because they share this same standard. We recognize that part of good service is providing trained and skillful technicians. Our service staff currently offers over 50 years combined experience in the residential garage door business. Leon and Steve also believe in being responsible members of their community and seek to do so in business as well. In recognition of their leadership in the industry, Leon was named to the Dealer Advisory Board for Clopay, the largest manufacturer of residential garage doors in the country. Hear what others are saying about us. Please take a moment to read our Testimonials.